The numbers above relate to the strings on my primary instruments. My ukuleles have 4, my guitars have 6 and the mandolins have 8. But they don’t get lower than 4, right? Wrong. 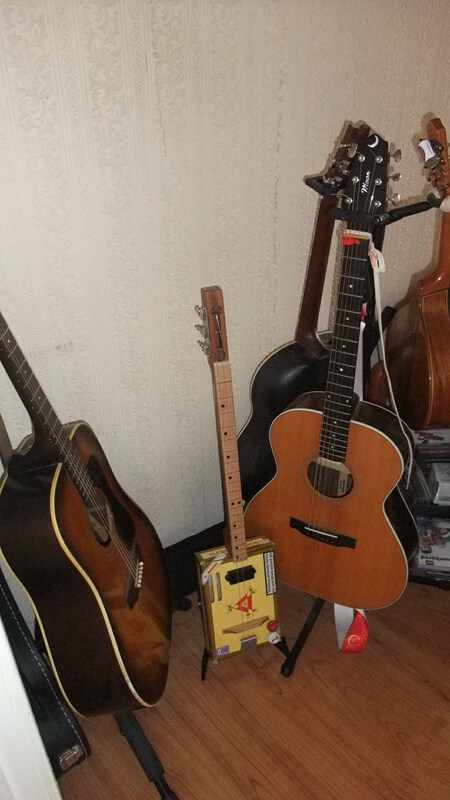 The Russian Balalaika has only 3 strings – and so does the latest addition to my stable of musical instruments – a Cigar Box Guitar. 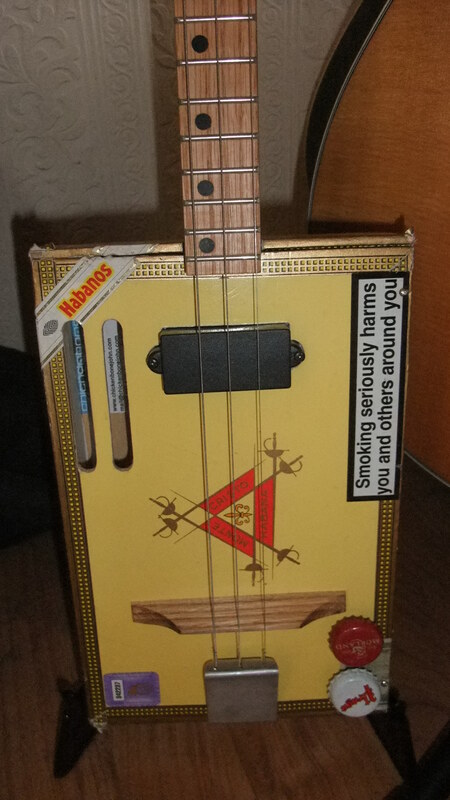 Why is it called a ‘cigar box’ guitar? Well, ermmm, it’s made out of a cigar box. I was visiting the guitar show in Haslingden, Lancashire last Sunday with Sara (she came along for the ride, really) and, whilst there were some lovely instruments on display, there was also a great deal of rubbish. The thing is, a lot of the ‘rubbish’ was trying to pass itself off as genuine craftsmanship (anybody else ever have a K guitar from the catalogue?). From the corner of the room came this incredible sound – really bluesy. I wandered over to see this ageing hippy type playing, quite literally, rubbish. 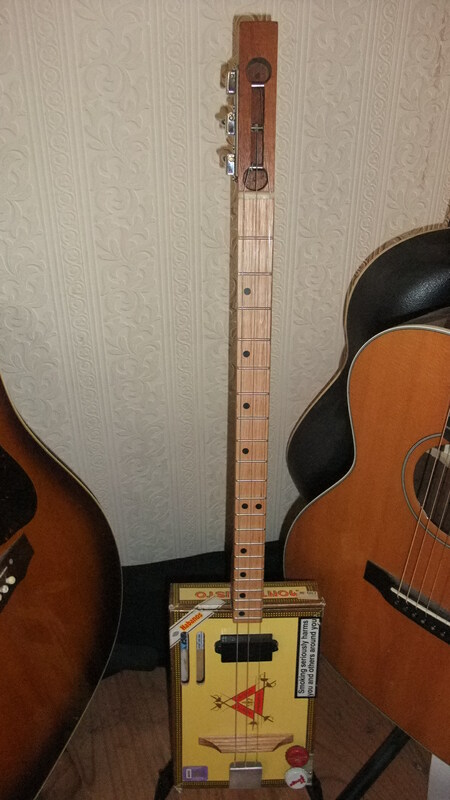 A 3 string guitar made out of an old cigar box. He’d just added a pick up and a neck and he was off. It sounded fantastic. It (I can’t bring myself to refer to the instrument as ‘she’ yet) is made from a box of Montecristo cigars from Havana (sadly empty). The cigars cost £303.00. The guitar didn’t. It has a Mahogany neck and the fretboard is from reclaimed English Oak with a gunstock oil finish (25.5″ scale length). The only ‘new’ bits on it are the nickel silver frets, the machineheads, the bone nut and the pickup – even the volume and tone controls are old bottle tops. Like I said, I’m no blues player and this instrument is brand new to me but, to give you an idea of what it can sound like, I slaughtered a well-known tune.